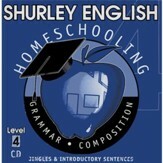 Shurley English Level 4 covers all eight parts of sentence types; parts of speech including indirect objects; quotations; reference skills; usage including pronoun/antecedent agreement; and more. 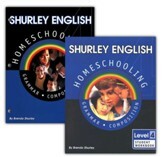 Nurture a love of the English language, along with an understanding of how it's correctly used, with Shurley English. Appealing to all styles of learners, students will repeatedly practice old and new skills, developing their mastery of English in reading, writing, and even thinking skills. This kit is comprised of the student workbook and the teacher's manual. Encouraging student-teacher interaction, the teacher's manual features comprehensive chapters that include everything needed for the lesson, including jingles, exercises, lessons, study notes, tests, checks, writing activities, and more. Lessons are scripted, with directions for students italicized, important concepts and words bolded, and charts included to help teachers and students visualize each idea. Student page numbers are referenced to help both parent and child easily find their respective places. "How to get started" and "jingle guidelines" provide additional hints and information for the teacher. Answers for the student practice and tests (included in the student workbook) are included chronologically. 406 three-hole-punched pages, softcover. Divided into a jingle section, reference section, practice section, and test section, students will need to flip to the necessary section in order to complete their lesson practice. The jingle section contains the lyrics to all the jingles, while the practice section provides a variety of activities, including matching, editing, multiple-choice, short answer, writing exercises, charts and other forms of written skill practice. Each test in the test section is divided into four areas: grammar, vocabulary, language skills and a weekly summary. Tests involve a variety of questions which should be familiar from the practice section. The reference section contains vocabulary words, an initial set-up plan, general reference notes, samples, and charts. 125 pages, softcover. An audio CD with the jingles and introductory sentences is also included to help students remember concepts such as parts of speech. This level 4 kit covers all eight parts of sentence types; parts of speech including indirect objects; quotations; reference skills; usage including pronoun/antecedent agreement; capitalization including outlines; verbs; pronouns; conjunctions; punctuation; letter, expository, persuasive, descriptive, narrative, and creative writing; figures of speech and writing autobiographies. 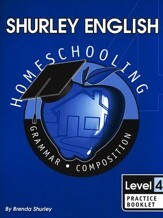 Students practice and reinforce their lessons in this Student Workbook, an integral component of the Shurley English system. Divided into a jingle section, reference section, practice section, and test section, students will need to flip to the necessary section in order to complete their lesson practice. The jingle section contains the lyrics to all the jingles, while the practice section provides a variety of activities, including matching, editing, multiple-choice, short answer, writing exercises, charts, and other forms of written skill practice. Each test in the test section is divided into four areas: grammar, vocabulary, language skills and a weekly summary. Tests involve a variety of questions which should be familiar from the practice section. The reference section contains vocabulary words, a beginning set up plan, general reference notes, samples, and charts. 125 pages, softcover. Level 4. 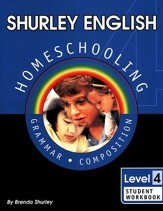 This introductory CD provides the noun, verb, sentence, adverb, adjective and other part-of-speech jingles, as well as the Question & Answer flows for the Introductory Sentences. This CD may be used as a resource for parents to refer to, or may be used to demonstrate the jingles and sentences to children. Level 4. A Practice Set consists of the Practice Booklet and Practice CDs. Saving you money, you'll have both practice tools at your disposal, but at a discounted price! Please note that the Introductory CD is not included with the Practice Set because it comes with the purchase of the primary kit. If you're pressed for time, or would like the convenience of having all your materials laid out and ready to go, the Shurley Practice Booklet will be a welcome addition to your Shurley homeschooling curriculum! This booklet contains the same introductory and practice sentences that are included in the teacher's manual, but instead of having to copy them elsewhere, students can easily classify the sentences in this easy-to-use timesaver. Approximately 20 non-reproducible pages, softcover. Level 4. 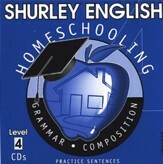 Perfect for reinforcing sentences for visual learners, and a great help for auditory learners, these Shurley English Practice CDs give your child an opportunity to hear each sentence read and classified aloud. Children will also be able to check their work independently! These practice CDs are not required to use the program, but are made available for parents who feel they would be beneficial to their children. Level 4. 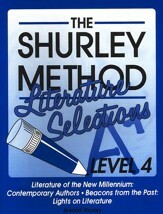 Introduce literature to your students with the Shurley English Literature Selections Booklet. Short contemporary and non-contemporary works by a variety of authors with different professional and geographical backgrounds have been selected. Both poetry and prose passages are included, along with a brief introduction to both art forms. An author biography helps students to get acquainted with the piece's history, and discussion questions allow for conversation and thought to focus upon the passage just read. Answer key included. Approximately 30 non-reproducible pages, softcover. Level 4.